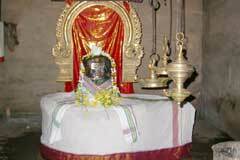 Saint Gnanasambandar had sung the glory of the Lord of the temple in his Thevaram hymns. 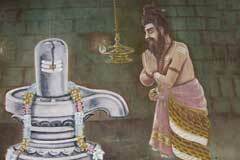 This is the 104th Shiva temple on the southern bank of Cauvery praised in the hymns. 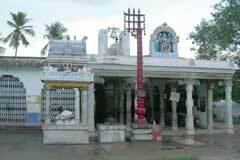 Mother Amirtha Nayaki shrine is at the right of the first entrance of the temple. 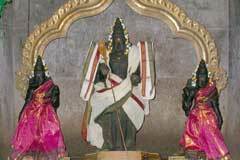 Passing through the inner tower entrance, the devotee will have the darshan of presiding lord. There are shrines for Lords Moola Vinayaka, Muruga, Sastha, Kala Bhairav, Sun, Moon, Sani Baghwan, Navagrahas the nine planets, Sage Durvasa, and Mother Gajalakshmi in the prakara. 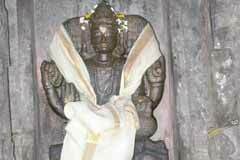 As the Divine Serpent Adisesha came to earth from the world below-Padala Loka to worship Lord Naganatha, the place is named Tiru Padaleswaram. 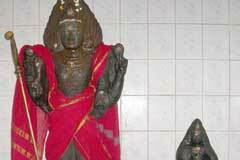 There is a shrine for Adisesha with human face and snake body. 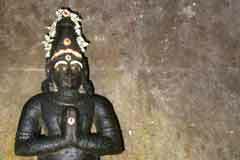 Adisesha is the head of the eight Nagas – Anandhan, Vasuki, Dakshan, Karkodakan, Sangabalan, Kulikan, Padman and Mahapadman and planets Rahu and Ketu. It is the staunch faith of the devotees that they would be relieved of all adverse aspects of snake planets if they worship Adisesha lighting ghee lamps. It is also noteworthy that no abishek is performed on Lingas made of sand, but the one made of ant-hill sand by Adisesha is an exception. 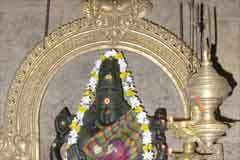 The place and temple is also noted for relief from Saturn problems as Lord Bhairava and Saturn together grace the devotees. Maha Maham festival is celebrated in dedication to Guru-Jupiter when He enters the Leo-Simha sign in the zodiac circle once in 12 years. As Lord Dakshinamurthi, authority for Jupiter planet is gracing in this temple sitting on four lions, those worshipping here the Lord are blessed ones. 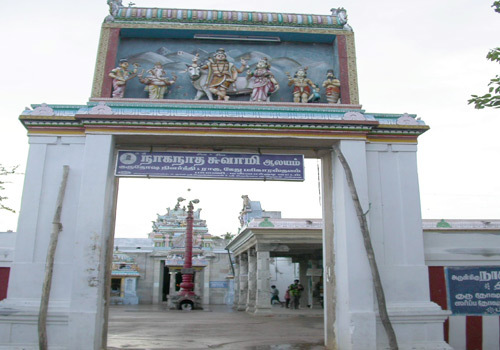 Disciples of Lord Dakshinamurthi once went to Vaikundam for darshan of Lord Vishnu, but they were denied admission by the Dwarapalakas-securities. The disciple sages cursed the securities and thus incurred a dosha for being rash. 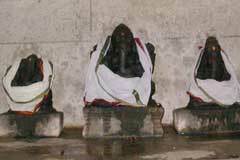 They worshipped Pamani Naganathar and Simha Dakshinamurthi and got relieved of the doshas. All those belonging to Leo, Kumba, Cancer, Saggitarius, Aries, Scorpio signs are advised to worship Simha Dakshinamurthi to realize a peaceful and happy life. A contest arose between Adisesha and Vayu Bhagwan about their prowess. Adisesha pressed the Meru Mount with its head and coiled it around. Vayu could not move the mount and thus was defeated. Vayu with all his fury controlled the air which led to suffocation of all beings threatening their lives. As requested by Devas, the contest took place again. Devas slightly reduced the power of Adisesha. Three of his heads became weak. Vayu broke three peaks. Saddened by its defeat, Adisesha, for mental peace, came to this place, made a Shiva Linga of ant-hill sand and worshipped Lord. The Linga is in the form of an ant-hill. Bus facilities are available to Pamani from Mannargudi.